One wonders if André Leon Talley, the subject of The Gospel According to André, would be of interest to anyone who didn't care one whit about fashion. He certainly has led a very interesting life, filled with famous people and grand wardrobes. However, while The Gospel According to André was fond of the subject matter, the film does not make as good a case for why the hoi polloi should take time to examine Talley's life. The film is divided into four 'chapters': Sunday Best, The Debutante, Black Superhero and Precious Memories. Each of them chronicles Talley's life to rise from poor black youth in segregated Durham, North Carolina to the couture houses of Paris and New York, eventually finding a place in 'the chiffon trenches' working at such magazines as Vogue. We learn of how he was influenced by the black church, where the women (including his beloved grandmother) wore their most elegant ensembles to present themselves in. He found refuge in the beauty within Vogue, especially whenever a black model was presented. His passion for fashion moved him to New York, where he became the protege of Diana Vreeland, doyenne of Costumes at the Metropolitan Museum of Art and former Vogue editor. Despite his entry to the decadent 1970s and the infamous Studio 54, where he danced alongside such figures as Andy Warhol and Halston, he avoided the drugs and promiscuity of the times. He went to 54 for the dance, not the decadence. His rise continued, and he became so focused on his career that he never developed a love of his own, no wife or partner to share his heart or bed. This, however, did not spare him from private humiliations, such as that because he was a black man, he had slept his way to the top among the Parisian fashion houses. He was even accused of being Mrs. Vreeland's lover! This came from the racist idea of being 'a black buck', something he rails against to this day. The slings and arrows kept coming to him. He recounts with a mix of anger and hurt how one figure at a Parisian couture house called him 'Queen Kong', his massive height of 6' 6" and girth not helping. Things come full circle as we close The Gospel According to André as he returns to his grandmother's home in Durham, which he has bought and restored, though putting in touches that remind him of his mentor Vreeland. 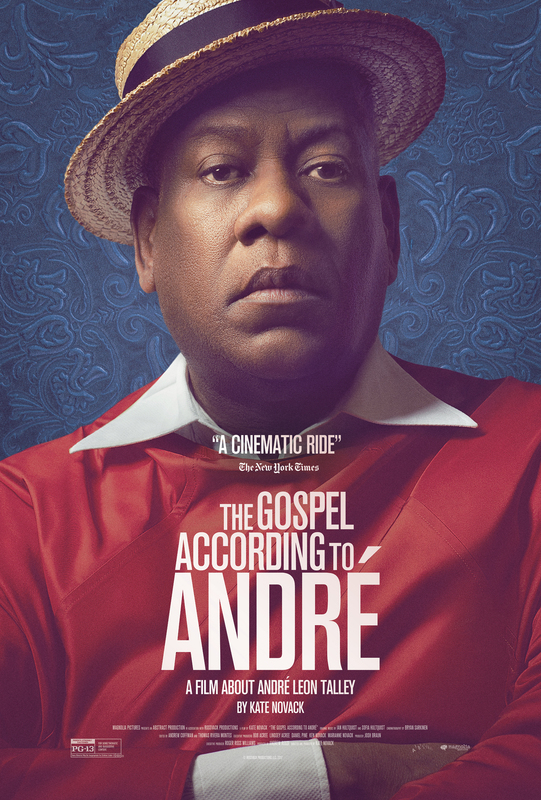 The Gospel According to André gives us an interesting portrait of a man who comes across as the love child of James Baldwin and The Fabulous Sylvester. However, as I watched Kate Novack's film my one question was would those who would not know a Gucci from a Givenchy, whose idea of couture shopping is Targét, really care about Talley or his life story. My answer would be 'not really'. We're treated to all these big-names in fashion like Marc Jacobs, Tom Ford and the notorious Anna Wintour, but I think most not involved or interested in the pret-a-porter world be slightly puzzled, even a bit lost among the jet set and our guide in his caftans and capes. The assertion that Talley is the 'Nelson Mandela of Couture' (said by either Sean "Puffy/Puff Daddy/P. Diddy" Combs or Will.i.am) seems downright jaw-dropping, meant as flattering but sounding almost insulting to Mandela. We're treated to videos of fashion shows and near-breathless discussions of the fashions presented (some archival footage from Talley's personal collection), but I don't think non-fashion mavens would know what to notice. Moreover, the closing footage of Talley holding court at the Met Gala where Combs, Rihanna and Mr. and Mrs. Tom Brady gushing about him and themselves has the effect of reminding us just how removed this world is from our own. The Gospel According to André does not help its case by putting the 2016 election in the background. Talley seems pretty excited for the election, and in this circle we see the confidence of how Hillary Clinton was going to sweep into victory. One of his clients to whom he gives fashion advise to told him on Election Day that her 'Pakistani guru' had told her they had nothing to worry about and thus, they could open the champagne. We then see him observing the Inauguration of Donald Trump and admitting he would be crucified for complimenting First Lady Melania Trump's look. As if 'Pakistani guru' wasn't enough to make Talley's circle look pretty bonkers. Why was he passionate about politics? Did he see this as a continuation against the entrenched bigotry in the fashion world? The lack of African-Americans or other minorities in positions of power at magazines or fashion houses? The continuing struggle for representation on covers and runways? That would have been interesting to explore, and we get hints of that. The best moments were the ones that revealed Talley the man, such as his joy at seeing an African-American First Lady or the hurt remembering the 'Queen Kong' jab. Listening to him say "I don't live for fashion. I live for beauty and style" are the good moments, ones that would have made The Gospel According to André a fascinating portrait. Seeing him with Isabella Rossellini and her literal pigs or hearing Tom Brady and Giselle touch on their own greatness is not fascinating but in turns bizarre and narcissistic. The Gospel According to André is not a bad film by any stretch. It just does not make a case as to why people should care about this larger-than-life figure. Still, it takes a look at a unique figure in fashion who has something to say.